Picture, if you will, soaking in the luxury of your very 2 person hot tub called Dream Star. 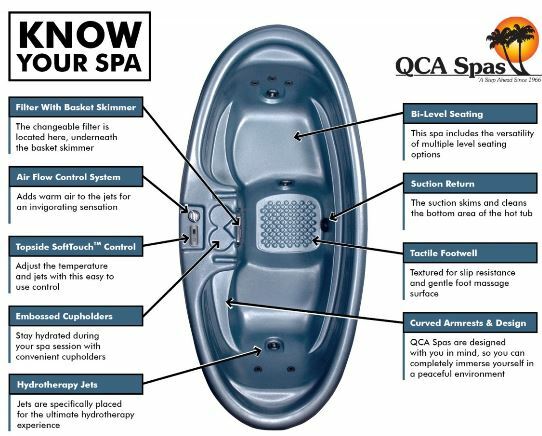 The QCA Spas Dream Star spa plugs into any designated 120 volt wall outlet. At 7.5 feet long by 3.5 feet wide by 2.4 feet deep (91″x 42″x 29″), this Lucite Acrylic tub even come with Microban Technology to prevent the accumulation of bacteria. Microban Technology is incorporated in the spa shell and in the filter . This is a more intimate and romantic model of a hot tub spa―perfect for couples young and mature alike. 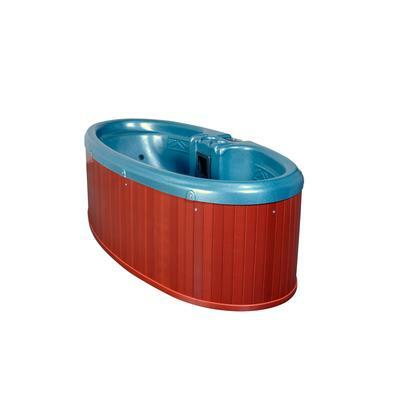 Even a single person can enjoy this tub as both ends have different settings for a little massage variation. The spa is great for the decor of any spacious basement nook or outdoor deck area. A 2 person spa uses less water than the big spas, is easily situated almost anywhere – indoors or outdoors. Although you may want to buy more than one, the QCASpas Dream Star is portable so you don’t need to. Plug it in from one 120 volt outlet to another. 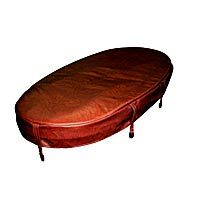 It is portable―but it is quite big―keep this in mind as it is not the same as an inflatable spa that you can put in the trunk. On the flip side, it is very sturdy and solid enough to be operated outdoors. It can be moved for a season though, for example up to the cottage and then back home. The portability is also more for you to take it from home to home should you move as this is a plug and play 120 volt spa that plugs into exterior power outlet. It comes with a 15 foot GFCI cord included. Wherever it is used, the foundation should be level and be able to support the weight of the spa, occupants and water. A quick and simple way of laying a foundation is to lay down some patio blocks from the local builders supply shop. The Weatherguard cabinet contrasts well with the Blue Denim color of this tub. (It is also available in white/silver marble). A sharp design for sharp taste―the covering panels are extremely durable and don’t fade in the sun. This 2-person hot tub spa is delivered plug and play ready. Just fill with a garden hose, plug the spa into a dedicated GFCI protected power outlet, hit the jets button on the control panel and bubble your troubles away. The eight jets are operated easily with controls just off to the side of the hot tub. The heat generated by the jet pump is also used to heat the spa and there is an air flow control system that adds air to the jets for the perfect relaxing pressure. The filtering system is pre-programmable with 2 cycles. You really can set it and forget all about it until you’re ready to get out. Relaxing in your very own Dream Star hot tub spa has never been easier! So you can sit back and enjoy the soothing benefits of hydrotherapy. Another useful and fascinating feature included with your Dream Star hot tub spa is the Heat Recovery System. This innovative technology helps store and recycle heat back into the water for optimal resource use and hot tub enjoyment. Now for the amenities… The QCASpas Dream Star comes with a 120V/15A GFCI protected cord. GFCI stands for ground fault circuit interrupter―meaning that if for any reason the current were to be compromised― an automatic shutdown would occur for safety. The spa also comes with the above mentioned jet assembly, pump, Heat Recovery System and finally a lockable flex cover. Hot Tub Outpost offers the free upgrade to a lockable hard cover instead of the flex cover as that is not suited for outdoor use without the solid interior cover core. One of the final features to discuss here is an add-on. Why not try an Ozonator? The Ozonator’s primary function is as a maintenance component. It mainly reduces the amount of chemicals sanitizer required to maintain your Dream Star spa. Apart from the included Heat Recovery System, adding an Ozonator is the greenest and friendliest thing you can do when purchasing your spa as it helps reduce chemical use. Finally be sure to get the hard cover instead of a flex cover that some outfits try to sell you. This is well worth the purchase if you plan on getting the best use out of your Dream Star Hot tub spa – especially if it will be outdoors. The whole package comes with a comprehensive factory warranty. Enjoy your bubbling and relaxation time!